There was showers a plenty for the TRI sponsored St Patrick’s Inter Schools’ Showjumping at the Meadows. It is impressive to see the geographic spread of schools from all over Ireland who are now competing at this very popular annual event. Twelve teams battled it out in the Novice section where the standard was exceptionally high. Only one of those completed on a zero score, a mixed team called ‘Fast & Furious’ taking the honours in a very fast time. The runners up were Ballyclare Secondary School. The biggest individual class of the day is always the Novice individual class and the recent St Patrick’s competition was no exception. Action was fast and furious amongst the 41 competitors with only fractions of a second dividing many of the top placings. However, the swift turnings of Kilkeel High School’s Charley Hanna and Trigger were rewarded with the top spot. The Open Team event on this occasion was also a Qualifier for the RUAS Balmoral Show in May, The Meadows Equestrian Centre were delighted to welcome Craig Killeff to the arena to make the presentations on behalf of overall sponsors, Bluegrass Horse Feeds. Following a tussle for the top, Borris Vocational School, all the way from Carlow emerged victorious, however unable to collect the qualification to RUAS Balmoral Show on this occasion, this went to Friends School, Lisburn as runners up. Individually, Sarah O’Shea gave a great account of herself as she and the very accomplished ‘Gucci’ were fastest around the course in the Open class, forcing Aoife Murphy and Garrynadruig Turbo, to settle for second place. It was extremely tight at the top of the Premier Individual class where Ben Rowlatt- McCormick and Mon Ami Tonnere claimed first place just 1.62 seconds ahead of his second horse Mon Ami Amie for Friends School. As always, Arena 2 begins with the Primary 50cms individual class. Nine of the youngest competitors turned out with the same adrenaline rush as the Grand Prix riders and they certainly provide just as much excitement. On this occasion Ellen McNabb from St Patricks P.S, partnering ‘Buddytwoshoes’, was one of the five double clears and finishing closest to the optimum time to take the red rosette. Jack Cowan slotted into second place with Jolly Jasper. In the 60cms class Regular Competitor Lily Murphy topped the leader board on her regular mount, Busby, just ahead of Nicole Peoples with Forest Flash. 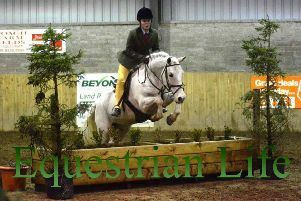 Year after year the professionalism of these young riders never fails to impress the judges. This is very evident in the Primary Team competition where their ring-craft and professionalism belies their tender years. In the Primary Teams section it was the team from Bronte, Tandragee and Fairhill Primary Schools who took the win on this occasion ahead of the Jumping Divas from Cairncastle, Linn, Whitehead and Lourdes Primary Schools. A very happy young rider, Taylor McKnight, took the honours in the Primary 70cms Individual class on his super little pony, Killeshin Bambino. They finished just ahead of Charlotte Betts and Percy, impressing the Tack & Turnout Judges on the day was Sophia Bingham who walked away with the prize for best turned out. A spokesperson commented: “Once again, the organisers would like to thank all Chefs d’equipe and pupils for their support and co-operation. Primary Individual 60cms: 1st Lily Murphy, Busby (Meadowbridge Primary School); 2nd Nicole Peoples, Forest Flash (Whitehead Primary School); 3rd James Courtney- Cadam, LCC Pebbles (McKinney Primary School); 4th James Courtney-Cadam, LCC Pugsy (McKinney Primary School); 5th Sienna Dalzell, Chester (Brownies Primary School); 6th Lucinda Heffron. Apple (Armstrong Primary School). Primary Teams: 1st ‘The Jolly Chicks’ (Bronte, Tandragee and Fairhill Primary Schools: Taylor McKnight (Bambi), Charlotte Betts (Percy), Ruby Kinkaid (Houdini) and Emma Burns (Perfect Peter); 2nd ‘The Jumping Divas’ (Cairncastle, Linn, Whitehead and Lourdes Primary Schools; Hannah Robinson (Poppy), Grace Reid (Misty), Nicole Peoples (Boo) and Amelia Bannon (Jude). Primary Individuals 70cms : 1st Taylor McKnight, Killeshin Bambino (Bronte Primary School); 2nd Chalotte Betts, Percy (Tandragee Primary School); 3rd Emma Burns, Perfect Peter (Holy Family Primary School); 4th James Courtney- Cadam, LCC Pugsby (McKinney Primary School); 5th India Heffron, Suzie (Armstrong Primary School); 6th Alfie Walker, Lenny (Orchard County Primary School). Novice Teams: 1st ‘Fast & Furious’; Christine Dallas, (Pancyffnoford Buster), Lucie McIlhatton, (Biscuit), Bethany Gordon (Glenford Starlight) and Emma Forbes (Rainbow Promises); 2nd ‘Ballyclare Secondary School’; Hannah McCartney (Dexter), Molly McCarntney, (Dexter), Katie Bamford (Tia) and Natasha McKernon (Prince Fantasia); 3rd ‘Down High Gold; Elie Simpson (Tigger), Rachel Bromme (Boyher Cookies n Creme), Abby Brown (Holiday Little Buzz) and Tara Emmett (Diamond Girl); 4th ‘Friends School’ Erin Barlow (Drumilly Dan), Gracie Lamont (Cuddoo Star), Anna Cardwell (TBC) and Amy Tubman (Connie); 5th ‘Banbridge Academy Waddell’ Eve Fitzsimmons (Godan Daginn Vik), Alistair Sands (Hillside Alfie), Rachel Sands (Ten A Penny) and Lara Jameson (Curious George); 6th; ‘Carrickfergus Grammar School’ Katelyn Irvine (O’Haras Dream), Ben Foser (Maisie), Erin Johnston (Fitz) and Katelyn Irvine (Duach Shadows). Novice Individual : 1st Charley Hanna, Trigger (Kilkeel High School); 2nd Katelyn Irvine, O’Haras Dream (Carrickfergus Grammar School); 3rd Ruby Kinkaid, Lismahon Houdini (Dromara Primary School); 4th Charley Hanna, Hazy (Kilkeel High School); 5th Sophia Moore, Cindy (Our Lady’s Secondary School); 6th Sarah O’Shea, Oreo (St Pauls High School). Open Teams (RUAS Balmoral Qualifier): 1st ‘Borris Vocational School’ Catherine Kavanagh (Coppenagh Blitz), Claire Kavangh (Clonagoose Daniel Dubh), Patrick Doyle (Boley Boy), Aoife Murphy (Garrynadruig Turbo); 2nd ‘Friends School’ Charlie Black (Oscar Rua), Anna White (Jimmy Thunderstruck), Tom Rowlett-McCormick (Mon Ami Tonnerre) and Ben Rowlatt-McCormick (Mon Ami Amie); 3rd ‘Down High School’ Zara Sharvin (Paint Ball), Tara Dixon (Fred), Alice Emmett (Sky Double J) and Abby Cumminsky (Apache Dove); 4th ‘Enniskillen Royal Grammar School’ Natalie Somerville (ISHD Convoy), Patrick Williams (Coill Dermiud William), Sophia Williams (Clonlee Red River) and Adrinna Hurts (Cheeky Blonde); 5th ‘Royal School Dungannon’ Emma Jayne Orr (Jazzy Suzie), Erin Mathieson (Chocolat II) and Bethany Smith (Allistragh Beauty); 6th ‘Drumragh Integrated College’ Conor Harris (Magic), Claire Murnaghan (Hacker), Paris Douglas (Prince) and Alix Hamilton (Star). Open Individual: 1st Sarah O’Shea, Gucci (St Pauls High School), 2nd Aoife Murphy, Garrynadruig Turbo (Borris Vocational School), 3rd Megan Nelson, Duke (High School Ballynahinch); 4th Claire Kavanagh, Clonagoose Daniel Dubh (Borris Vocational School); 5th Ellen Ward, Phoenix Phantom (St Jospeh’s Grammar) and 6th Niamh Fitzpatrick, Eric (Methodist College). Premier Open Individual: 1st Ben Rowlatt-McCormick, Mon Ami Tonnere (Friends School), 2nd Ben Rowlatt-McCormick, Mon Ami Amie (Friends School); 3rd Caoimhe Crozier, Dunromin Banjo (Wallace High School).